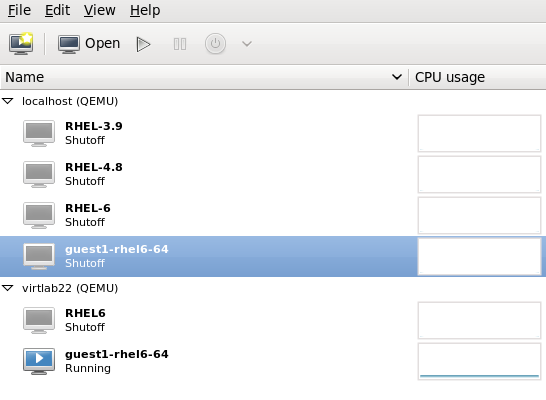 This section covers migrating a KVM guest virtual machine with virt-manager from one host physical machine to another. Open virt-manager. Choose Applications → System Tools → Virtual Machine Manager from the main menu bar to launch virt-manager. 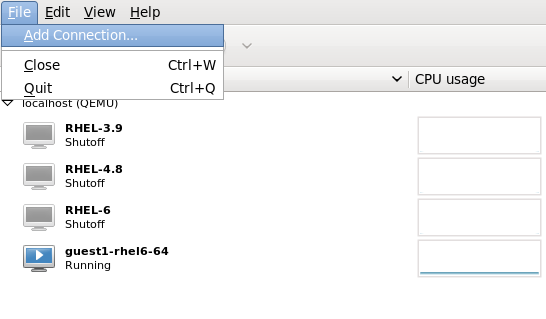 Connect to the target host physical machine by clicking on the File menu, then click Add Connection. The Add Connection window appears. Method: Select the connection method. 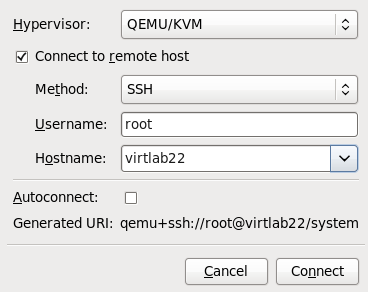 Username: Enter the user name for the remote host physical machine. 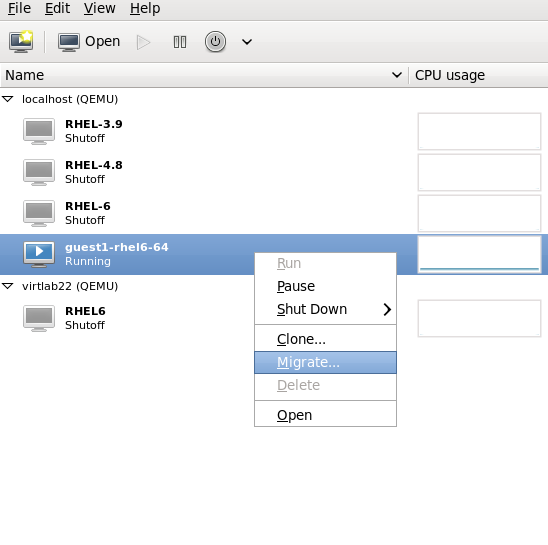 Hostname: Enter the host name for the remote host physical machine. Click the Connect button. 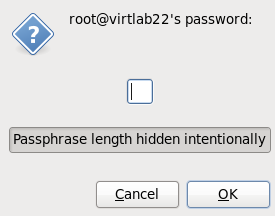 An SSH connection is used in this example, so the specified user's password must be entered in the next step. 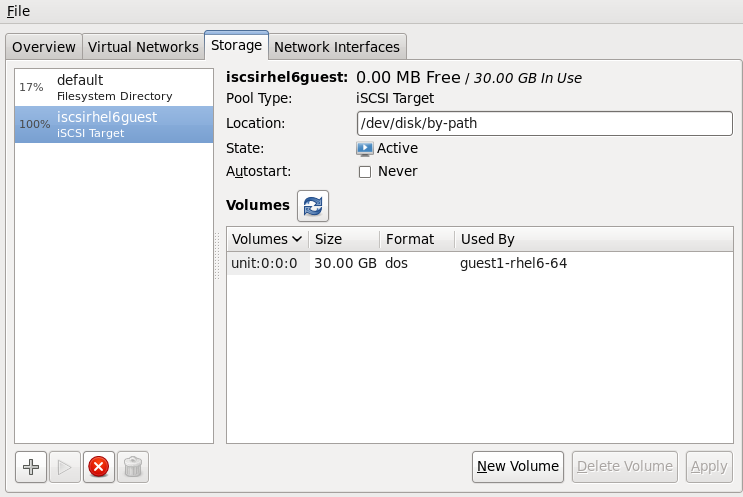 Open the list of guests inside the source host physical machine (click the small triangle on the left of the host name) and right click on the guest that is to be migrated (guest1-rhel6-64 in this example) and click Migrate. In the New Host field, use the drop-down list to select the host physical machine you wish to migrate the guest virtual machine to and click Migrate. 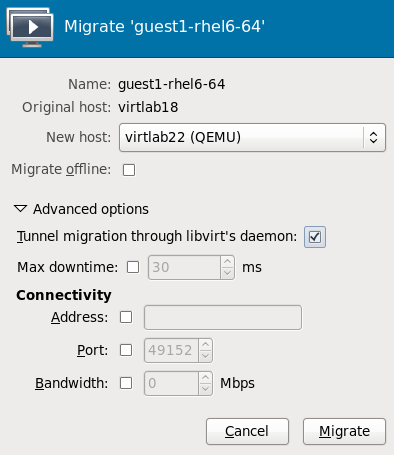 virt-manager now displays the newly migrated guest virtual machine running in the destination host. The guest virtual machine that was running in the source host physical machine is now listed inthe Shutoff state. 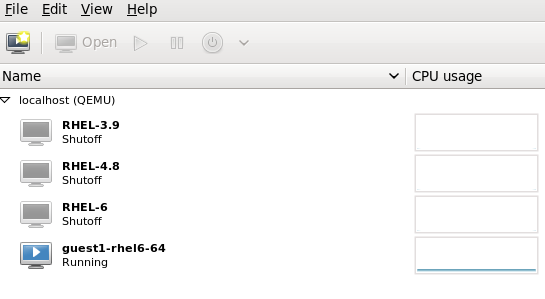 In the Edit menu, click Connection Details, the Connection Details window appears.